Zipline over mountain vistas. "Tarzan did it … now so can you. 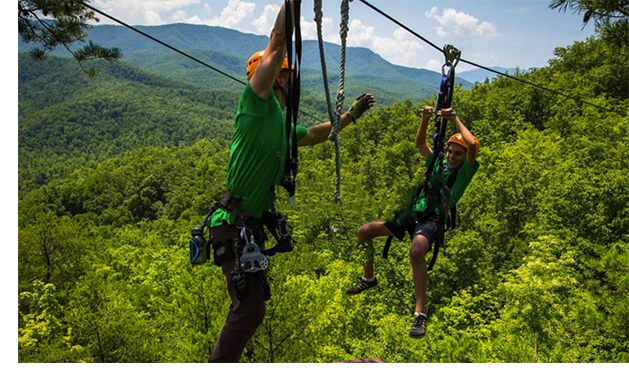 Flying through the trees at up to 25 miles per hour is an exhilarating experience you'll never forget," says Smoky Mountain Ziplines. Each participant is provided with state of the art equipment including helmets, full body harnesses, trolley, gloves and tether lines. "All flyers will need to arrive wearing tee shirts, longer shorts or pants and closed toed shoes (required). Tours run rain or shine so please dress appropriately for the weather. Harness seats will wrap around your upper thigh, shoulders and waist so collared shirts and pants will be more comfortable. You will be wearing a helmet, so ball caps are not recommended. Long hair must be tied back and secured. Please leave your cell phones in the car," says Adventure America Zipline Canopy Tours.